Food & Drink is a free Windows 8 Food App. This App can help you to find places to eat at a particular location. The app will even provide you with the map for that place using the Google street view. The resulting places for that location will come arranged in various categories, namely: Cafes, Pubs and Bars, Seafood, Restaurants, Fast Food, and many others like that, which are present at the main screen of this Windows 8 Food App. You also have the option to share the results, and the map location for the places, using the Windows 8 Share Charm. 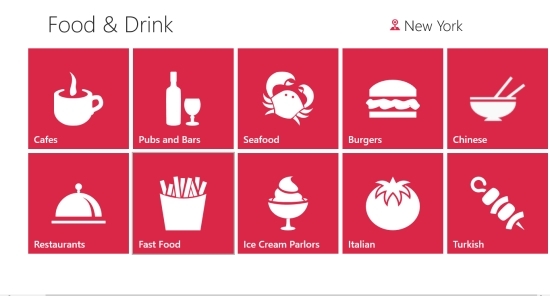 Food & Drink is freely available under the Food & Dining category of the Windows Store. As you land in the app for the first time, it will ask you whether it can access your location. According to your location, this Windows 8 Food app will provide you with the nearby places for food and dining. 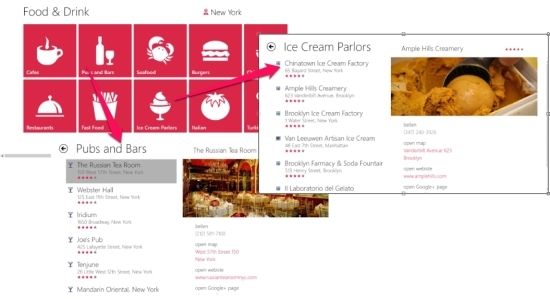 Now, as you go to any of the categories that are available on the main screen of this Windows 8 Food App, places that are matching that category for that location will be shown to you. In this Windows 8 Food App, for all the categories matching for a particular location, the result comes with two panels. The panel on the left side contains all the places matching the search, and the panel on the right side will provide you with the photos, pictures, and Google street view for that place. For seeing all the photos, use the arrows that are available on the left and right side of the photo. In addition to that, you can use the Open Map option that is given in the right panel itself, to open up the map location using the Bing Maps. In this Windows 8 Food app, in order to change the location for which you want to find places to dine, you can use the option that is given on the main screen at the top right side of the app. You can also use the bottom flyout of this Windows 8 Food App or the Windows 8 Settings Charm to change the location. You can find places for food and, dining for any location. Inbuilt feature of Maps for locating the places better. 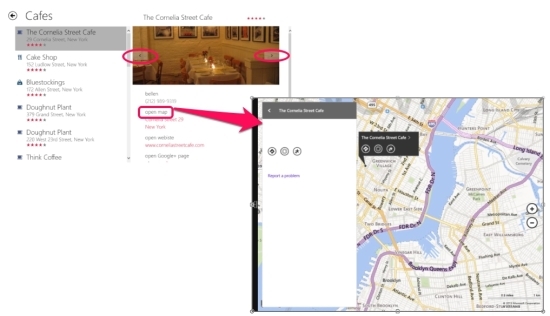 You even can share these location maps over the Internet using Windows 8 Share Charm. Working with this Windows 8 Food App is quite easy. The Interface of the app is quite nice. According as my experience with this app, this app is quite nice. Finding food, and dining places near any location is quite easy. You can even use the address of any location, to find places of food, and dining near it. All in all, a nice Windows 8 Food App, Food & Drink deserves a try for sure.